For a full biography of Charlotte Toynbee’s husband, the social reformer and political economist Arnold Toynbee (1852–1883), see the Oxford Dictionary of National Biography or his entry in Wikipedia. He himself is buried in Wimbledon churchyard. Charlotte Maria Atwood was born at Maswell Hill, Hornsey on 31 March 1841 and baptised at St Mary’s Church there on 20 May. 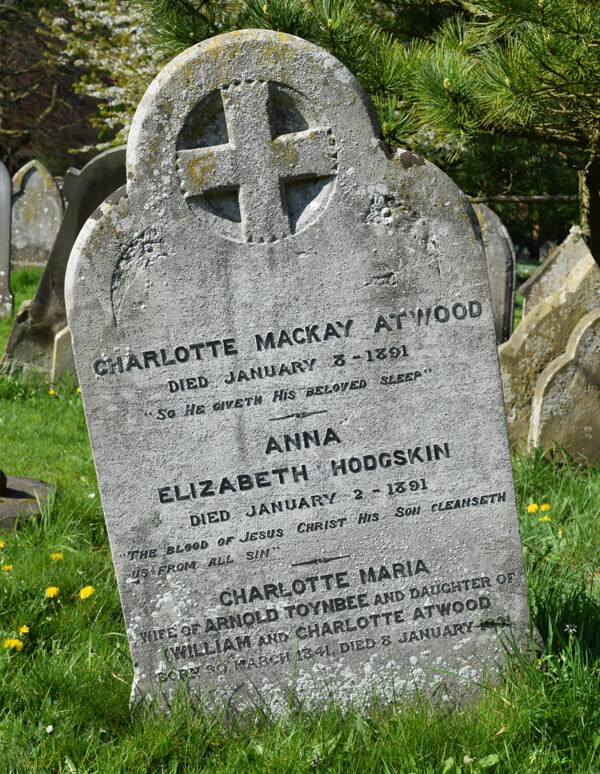 She was the only daughter of William Duncombe Atwood (who was described as a gentleman in the baptismal register) and Charlotte Mackay Hodgskin. On 26 June 1879, when she was 38 years old, Charlotte Maria Atwood married Arnold Toynbee. Mrs Toynbee became a college administrator and local government official and has her own separate biography in the ODNB. Arnold and Charlotte Toynbee lived first in east Oxford, and then from early 1881 in Bevington Road in north Oxford. Charlotte’s father William Duncombe Atwood had died in 1875, and at the time of the 1881 census her widowed mother Mrs Charlotte Mackay Atwood was living on her own at 5 Thornton Villa, Wimbledon and the Toynbees were visiting. When Arnold Toynbee died from meningitis at the age of 31 in 1883, they were probably on a similar visit. † Anna Elizabeth Hodgskin died at 10 Norham Gardens at the age of 84 on 2 January 1891, and was buried at St Sepulchre’s Cemetery on 7 January (burial recorded in parish register of St Giles’s Church). † Mrs Charlotte Mackay Atwood died at the age of 82 on 8 January 1891, and was buried at St Sepulchre’s Cemetery on 13 January (burial recorded in parish register of St Giles’s Church). Her effects came to £193 0s. 1d. Mrs Atwood's daughter Mrs Charlotte Toynbee remained at 10 Norham Gardens for the rest of her life. She was a leading opponent of women's suffrage: more information on her involvement can be found in Katherine Bradley's doctoral thesis “Faith, perseverance and patience: the history of the Oxford suffrage and anti-suffrage movements, 1870–1930”. † Mrs Charlotte Maria Toynbee, née Atwood died at 10 Norham Gardens on 8 January 1931 and was buried in St Sepulchre’s Cemetery on 10 January (burial recorded in parish register of St Giles’s Church). Her effects came to £12,884 8s. 1d.